Hello ladies! Today I'll be sharing one of The Body Shop's raved product called the Baked to Last Blush. They come in two shades: Coral and Petal shades. Create a fresh, flirty, natural-looking complexion with a clever blusher duo, handmade and slow-baked for up to eight hours of deliciously rich color. Spherical powders allow for a perfect glide of application. High levels of pearl give a stunning visual effect both within the dome and on the cheek. Handmade and slow baked formulas create unique patterns to ensure individuality for each product and + binds the ingredients for long-lasting wear. Community Trade olive oil from Italy helps to condition skin. The Body Shop's Baked to Last Blush caught my attention specifically because of how compactly it is place on the container. I also love the fact that it is packaged together with a highlighter. Shockproof. Mine have dropped several times yet the powder inside the container is still intact without any visible signs of cracks because of how it is compactly place together inside it's container. Waste proof. As mentioned above due to how they are compactly place together inside the container it does not pick up excess powder in the blush brush so no need to tap out the excess. You can easily control how much blush to put on your face too. Two products in one: blush and highlighter. I use this for my everyday look and would normally blend out both the blush and the highlighter. It creates a beautiful pearly pink metallic finish. The blush alone gives a soft sheen finish to your cheeks when applied. The petal shade doesn't look too harmonious and natural on my skin. Perhaps I should have chosen the coral shade instead for my skin tone. Apply small amounts of this product on your cheeks first and continue by building it up until satisfied. I would suggest to not overdo the application else you'll end up having an overly shiny face. Remember we wanted to achieve a glowy youthful finish. 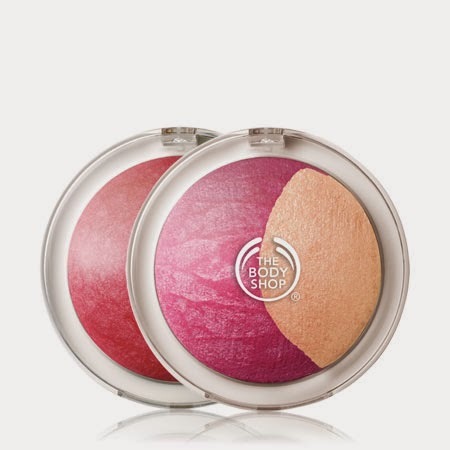 The Body Shop's Baked to Last Blush is a lovely product though I'm not a fan of shimmery makeup products. I do hope they will create matte versions of this.